Greg Dember is a professional musician. Many times you come across a band composed of musicians that stick to the script and play music that is conventional and unexciting. It’s not that they don’t take risks because they want to be mundane. They don’t take risks because they do not have the musical ability to do so. 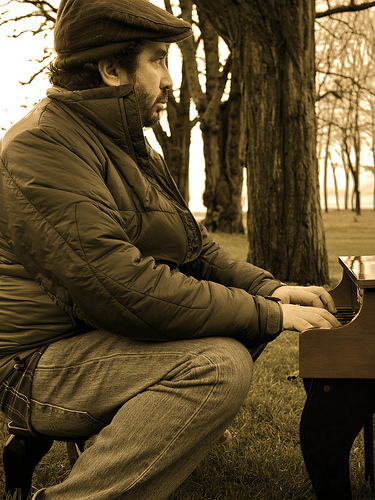 Dember, a technical piano player from Seattle, has been punching out creative melodies since the 90’s, and his March release of his second solo album Water Makes Waves is proof that he does not like to settle for boring rhythm and melody. Instead, Dember creates an album that I coin an Indie Grab Bag, jam-packed with horns, strings, synths and intriguing harmonies. The album is imbued with innovative sounds, and part of the excitement of listening is that you just don’t know what will come next. “How We Met” is just one example of Dember’s music. It begins with a comfortable piano riff that stays neatly in the background when Dember’s soothing folk voice joins the piece. The soft string section adds scene to the song and creates an almost Ben Folds-like indie sound. At around two minutes listeners are treated to a hint of horns that come and go quickly, replaced by the impressive piano melody that transforms into the base of an instrumental that features violin plucks and drawn-out, but contained, horn appearances. It is a full-bodied song and, like a good ale, goes down smoothly. It is also a solid preview of the rest of the album which, while being different and creative, never loses its flavor. Interested in being featured on the Music Court? Send your information to musiccourt@gmail.com and I’ll be happy to take a listen.